Im' getting an error when deploying an artifact in my own repository in a Nexus server: "Failed to deploy artifacts: Could not transfer artifact" "Failed to transfer file http:///my_artifact. Return code is: 400"
and get the error. Any idea? Check those and if you still run into trouble provide more details here. Just to create a separate answer. The answer is actually found in a comment for the accepted answer. Try changing the version of your artefact to end with -SNAPSHOT. I had this exact problem today and the problem was that the version I was trying to release:perform was already in the Nexus repo. In my case this was likely due to a network disconnect during an earlier invocation of release:perform. Even though I lost my connection, it appears the release succeeded. In the rare event that you need to redeploy the SAME STABLE artifact to Nexus, it will fail by default. If you then delete the artifact from Nexus (via the web interface) for the purpose of deploying it again, the deploy will still fail, since just removing the e.g. jar or pom does not clear other files still laying around in the directory. You need to log onto the box and delete the directory in its entirety. Ensure that not exists already (artifact and version) in nexus (as release). In that case return Bad Request. 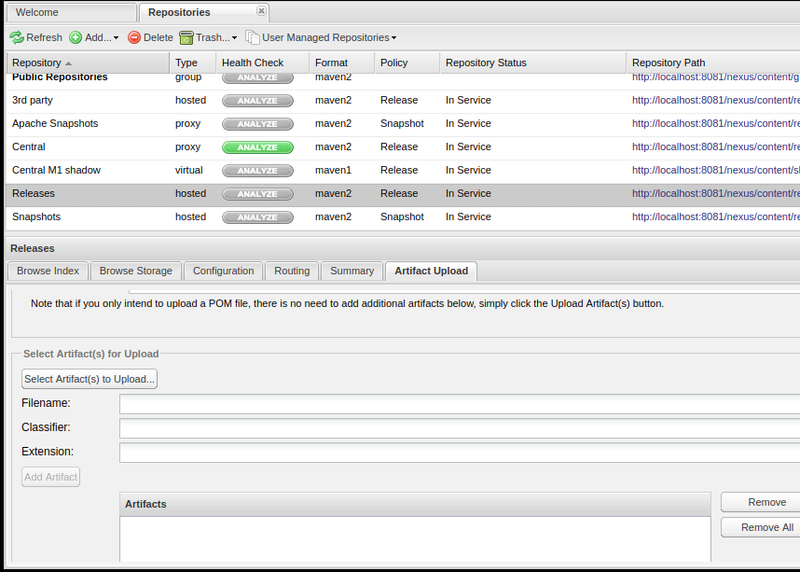 One solution not mentioned yet is to configure Nexus to allow redeployment into a Release repository. Maybe not a best practice, because this is set for a reason, you nevertheless could go to "Access Settings" in your Nexus repositories´ "Configuration"-Tab and set the "Deployment Policy" to "Allow Redeploy". If any of the above answers worked out, You can create new artifact directly from the admin side of (NEXUS Screen shot attached below). Click repositories on the left side then click the repo, For eg: click release. Choose artifact Upload (last tab). Choose GAV definition as GAV Param- Then enter your groupid , artifact id and version . Click upload artifact. Thats it ! This can also happen if you have a naming policy around version, prohibiting the version# you are trying to deploy. In my case I was trying to upload a version (to release repo) 2.0.1 but later found out that our nexus configuration doesn't allow anything other than whole number for releases. I tried later with version 2 and deployed it successfully. Not the answer you're looking for? Browse other questions tagged maven deployment pom.xml nexus or ask your own question. how to deploy my artifact on to my nexus? How to configure maven project to deploy both snapshot and releases to Nexus?